Lots of graphics and video effects can be described by a coordinate transformation: There is a rule for calculating destination coordinates from the source coordinates. The rule completely describes the type of transformation. With this one can implement e.g. scaling and rotation. 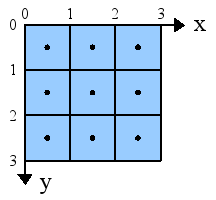 If the vectors and matrix are given in homogeneous coordinates, one can also shift the image by a vector. 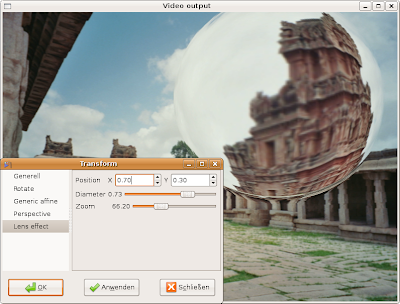 Other transforms can be Lens distortion, perspective distortion, wave effects and much more. This is e.g. the case where an image is downscaled. Gavl handles these by not touching the destination pixel at all. Then you can fill the destination frame with a color before the transformation and this color will be the background color later on. The start index n and the interpolation coefficients are saved in the interpolation table. 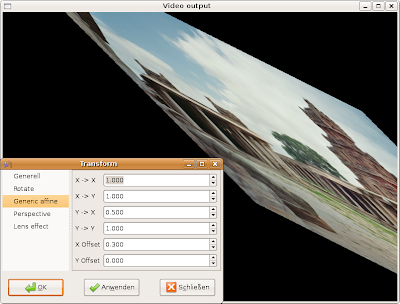 After shifting the table, the interpolation routine works without branches (and without crashes). 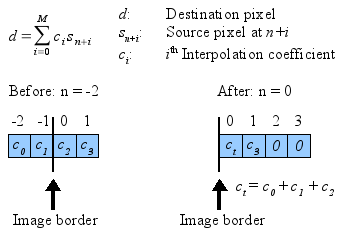 Due to the way the interpolation coefficients are modified we assume that the missing pixels at -2 and -1 are the same color as the border pixel at 0. Of course this is done for x and y directions and also for the case that indices are larger than the maximum one. 1. How exactly are coordinates defined? 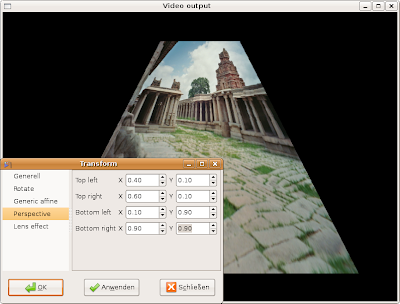 The sample values for each pixel are taken from the pixel center. This means, the top-left pixel has a color value corresponding to the location (0.5, 0.5). For chroma planes, the exact sample locations are considered as described here. One is tempted to think, that this all-in-one solution can be used for scaling as well. It is, of course true, but it's a stupid thing to do. Scaling can be highly optimized in many ways. The gavl_video_scaler_t does this. It's thus many times faster than the generic transform. The image transform makes no assumptions about the type of the transform. Especially not if the transform corresponds to downsampling or not. And this is where some issues arise. While for upsampling it's sufficient to just interpolate the destination pixels from the source pixels, for downsampling the image must be low-pass filtered (i.e. blurred) first. This is because otherwise the sampling theorem is violated and aliasing occurs. A very scary example for this is discussed here. One more reason to use the gavl_video_scaler_t wherever possible because it supports antialiasing filters for downscaling. 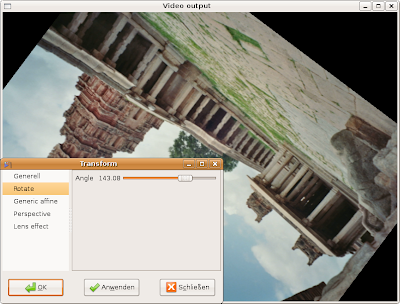 The good news is that usual video material is already a bit blurry and aliasing artifacts are hardly visible. After this much theory, finally some examples. These images were made with the gmerlin transform filter (the original photo was taken in the South Indian ruin city of Hampi). Perspective effect. 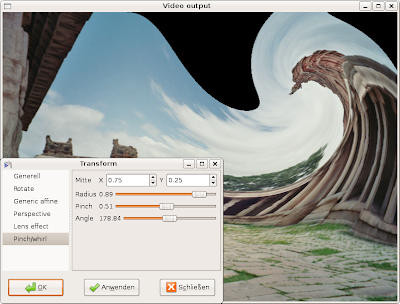 Coordinate transform ported from the Gimp.